ConnectPV partnered with Sensata Technologies, the leader in Arc Fault Detection (AFD) technology, to deliver best in class Arc Fault Detection and Circuit Interruption (AFCI) capable Arc Fault Combiner Boxes. Leveraging its leading expertise in aerospace AFD products, Sensata developed an accurate and reliable family of arc fault detection modules for the Solar PV industry, validated through extensive testing with a broad variety of inverters. ConnectPV integrates Sensata’s PVAF-R Modules that signal the high-reliability load break rated contactors to open the output circuit in the event of a Series Arc Fault. This AFD functionality is built into ConnectPV’s Contactor Combiner Product Family, adding to the remote ON/OFF control functionality for rooftop or ground mount projects. 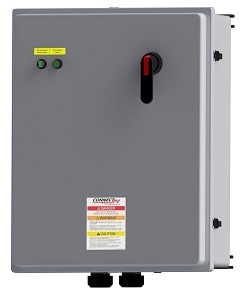 The Arc Fault Combiner Box can be linked to Emergency Power Off and/or Maintenance Power Management Control Circuits to improve safety and serviceability for projects and to comply with Rapid Shut Down requirements per NEC 2014 690.12. Compatible with positively or negatively grounded systems without DC Optimizers, grounded or ungrounded (floating).